ReefSAM 3D cutaway section showing the internal “anatomy” of One Tree Reef (S GBR) (Barrett and Webster, 2017). Please join me in congratulating of GRG collaborator Sam Barrett on the publication of the new paper in the journal Marine Geology. Given their complexity coral reef systems are incredibly challenging to numerically model, particularly in time and space. 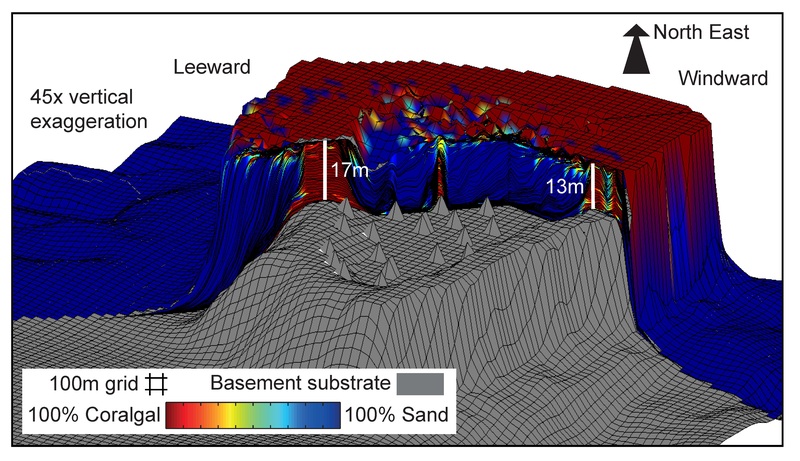 This paper presents an innovative 3D forward stratigraphic model designed to accurately simulate reef processes, geometries, and internal facies variations, operating on spatio-temporal scales of 100 m and 100 years respectively. Conceptual vs. numerical models on One Tree Reef (S GBR) (ReefSAM and CARB3D) (Barrett and Webster, 2017). Simulations of the well-studied Holocene One Tree Reef (OTR), in the southern Great Barrier Reef (GBR) showed improvements upon previous modelling attempts in both quantitative measures (e.g. lagoon size or reef sea level catch-up time), and ability to produce more realistic reef-scale morphological features (e.g. lagoonal patch-reefs, mostly sand-filled lagoon) and reef development characteristics (e.g. transition from mostly vertical aggradation during sea level catch-up to horizontal progradation afterwards). Bravo Sam! Also check out the video of the ReefSAM model in action (2D only) here! 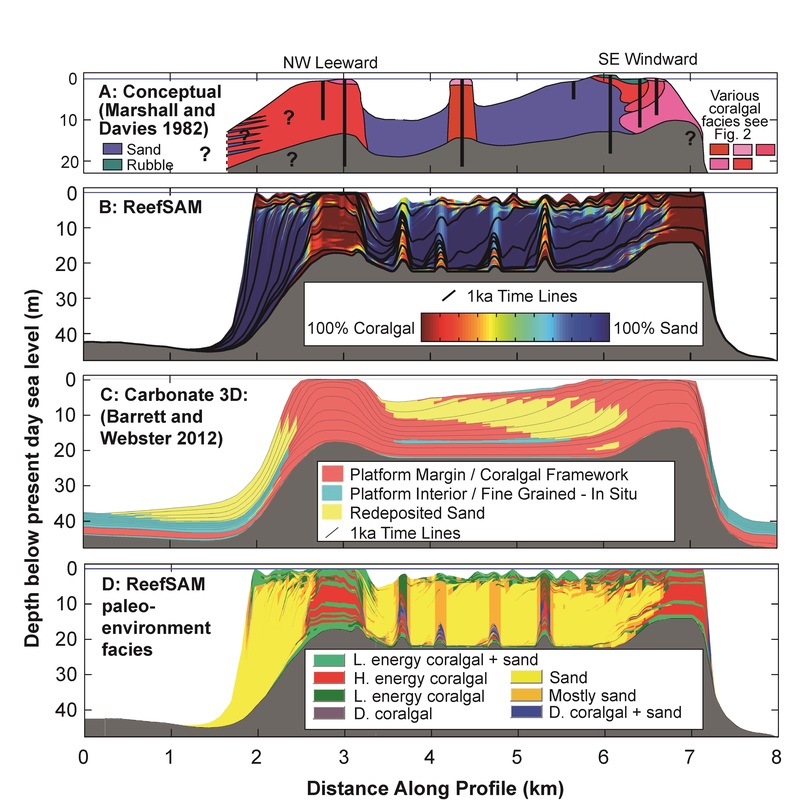 This model represents an important foundational step towards ongoing efforts led by Tristan Salles to better simulate coral reef and carbonate platform evolution. This represent an exciting new collaboration between the GRG and Earthbyte research groups.